Iveco Daily Chrono Service: maintenance and support timely and efficient. Four basic operations (brakes, mufflers, oil filters, shock absorbers) for a more in Daily perfect efficiency: this is the Daily Chrono Service. The fundamental strengths of the Daily Chrono Service are the speed and quickness of response: the presence of dedicated stations makes it possible to assist the media without reservation. immediate replacement of the exhaust system with original parts Iveco, Change oil and filters, guaranteed by Iveco brands and Urania replacement shock absorbers. The Daily Chrono Service technicians are always on hand with their valuable advice for a careful maintenance and custom vehicle setup, rapid replacement of brake pads and brake discs (including control of the parking brake). Your work never stops! 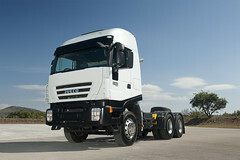 The new version of "Iveco On the Road", Iveco with the application of content and services essential travel. ​Customer Services Iveco: discover all the After Sales Service. A wide range of programs customized service.